They've cited cost reasons, frustrated children with models that fall apart... With the demise of Lego Universe I can only assume Lego Chief Executives have had a meeting and decided that to maximize profitability withdraw any products or services which aren't as profitable. Personally I think Lego Universe is a great game - but the wrong game. Lego Design by me is a great service though - the problem is it is too expensive. There are better ways Lego Design by me could have addressed this than shutting up shop though! First of all, offer several levels of Lego Design by me service. A basic where you get a bag of bits and print your own instructions and box cover off. A Lego Design by me 'silver' where you get the bag of bits, the standard box and printed instructions and a gold Lego Design by me service which includes the glossy cover for the box with your custom lettering. My nephew was very impressed with my Space Patrol Set when he saw me building it a few weeks ago. So because Lego Design by me is ending I decided to design and build him a Lego Design by me custom Lego Set for Christmas. An expensive present - but it's my last chance to order a set and his last chance to own one. I don't think he'll read this blog - so I think it's safe to show you an image of the model. 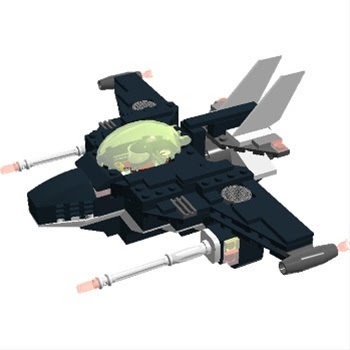 I called it the LCX1 Fighter (His initials are L.C.) and I just had room to make the box say Designed by MS for Luke. All in all I'm very sad that Lego Design by me is ending, Lego Design by me was probably the best service or product that Lego was offering. I can see the issue - designing models looks easy - but to make sure your Lego Design by me model will be solid and not fall apart needs an eye for detail, a lot of patience and a great deal of thought. I totally agree. The service was expensive, but there's no need to shut it down. Will the LDD still work? As far as LDD is staying, and there are rumours they may start enabling unlimited mode as the default - which gives more freedom. Please give my set a vote by the way! I'm so sad it's dying, I ordered several sets I had personally designed, it was really special.